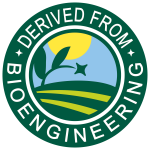 Inclusion of a “bioengineered” or “derived from bioengineering” symbol alongside a sunny plant and farm field. 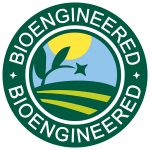 USDA decided not use the bioengineered symbols from its proposed rule, which mimicked a happy, smiling sun, but its new symbol is not a major improvement. Notification through a QR barcode. Despite widespread criticism that using a QR code will discriminate against the elderly and poor who may not have smartphones, the Department has provided that as an option. A phone number to text that will reply back with information. Many are concerned about the privacy aspect of this requirements, as this provision would require concerned consumers to disclose their private contact information to food companies. Many advocates urged USDA to require only the last option, but under the final rule food companies are only required to choose one, making it easy to continue to hide GE ingredients from consumers. Perhaps most concerning is how narrowly USDA decided to define foods subject to GE disclosure. For instance, if a food product has multiple ingredients, but the first product on the ingredient list is either meat, poultry, eggs, broth, stock or water, even if other ingredients in the product are GE, USDA will not require GE disclosure. Further, food products containing “refined” GE ingredients (such as oil from GE soybeans, or candy bars with high fructose corn syrup from GE corn) will not require disclosure as long as the refining process is “validated” by USDA. Taken as a whole, many advocates are uncertain that consumers are now better off than before the weak and controversial bill was signed into law by President Obama in 2016. Fearing consumer backlash, even large food companies are speaking out against the final rule. Sustainable Food Policy Alliance, which includes Danone, Mars, Nestle, and Unilever, wrote in a statement “The standards fall short of consumer expectations, and the practices of leading food companies, particularly when it comes to how we are already disclosing highly-refined ingredients and the threshold for disclosure.” While big food retailers are upset, organizations such as the American Farm Bureau Federation, which represents the companies that develop and produce GE crops, were pleased with the final version of the rules. 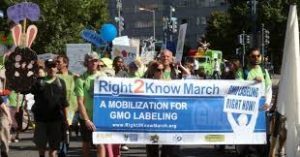 The passage of mandatory GE labeling came prior to the implementation of Vermont’s landmark legislation, after it survived a court challenge from many of the industrial food companies now opposed to USDA’s requirements. Senators Stabenow (D-MI) and Pat Roberts (R-KS) struck a deal that ultimately resulted in these predictably weak, anti-consumer provisions. Beyond Pesticides and many other advocates for GE labeling are primarily concerned about the health impacts of consuming products awash in pesticide residue, and believe consumers have a right to avoid products produced as part of a highly toxic GE agriculture system. Herbicide-tolerant GE crops have been associated with massive increases in herbicide use and the rampant takeover of U.S. farms by weeds which, through incessant herbicide spray, have themselves developed genes to resist herbicide effects. Glyphosate, the most common herbicide developed to be sprayed on GE plants, has decreased in effectiveness. Now, chemical companies are using older herbicides like 2,4-D and dicamba that rival glyphosate’s toxicity. Chemical companies have also incorporated insecticides into the crop itself, with evidence that resistance in target pests is trending synthetic insecticide use upwards. The fact remains that the sort of techno-utopia of plant drought and disease resistance, increased vitamin content, and the like promised by agrichemical companies that develop GE crops has never been widely commercialized. Critics maintain that the main goal of GE crops is not to solve real agricultural problems, but instead to increase sales of seeds and pesticides, and companies’ profits and stock prices. Why else would they want to keep consumers in the dark? For more information on the health and environmental impacts of herbicide tolerant and insecticide incorporated GE agriculture, see Beyond Pesticides GE program pages. This entry was posted on Tuesday, January 8th, 2019 at 12:00 am	and is filed under 2,4-D, Dicamba, Genetic Engineering, Glyphosate, Labeling, Uncategorized, US Department of Agriculture (USDA). You can follow any responses to this entry through the RSS 2.0 feed. You can skip to the end and leave a response. Pinging is currently not allowed. GE products MUST be properly labeled as such.